An explosion of colour awaits visitors to Emsworth this spring. On April 28, 29 and May 5, 6 and 7, Emsworth Arts Trail will showcase the varied work of more than 100 talented artists within the town.Carol Price, chairman of The Emsworth Arts Trail, said: “From home studios to community halls, businesses, sailing clubs and churches, artists will open their doors to art lovers on its popular annual arts trail. “Nearly all venues are located within a mile of Emsworth’s town centre. By walking or cycling, visitors can look forward to meeting artists and have a chance to purchase their work. A full spectrum of mediums and styles including painting, printmaking, photography, furniture making, weaving, woodturning, ceramics, jewellery and textile art will be on display. We have lots of exciting new artists and makers this year, offering something new to visitors, alongside many established names that have been part of the trail since its launch in 2001. The Boat Project, the Arts Council England initiative that formed part of the London 2012 Olympic Festival, will be on display at Hollybank House during the first weekend of the trail. Collective Spirit is made of thousands of donated wooden items and was built in Emsworth during 2011-12. It documents the lives of people within the South East of England, with many items coming from local residents. Hollybank House will also host a collection of artists on April 28-29 and promises to offer visitors a special experience this year. Emsworth Arts Trail was first established in 2001 with just six artists opening up their studios to the public. Interest in the event and participation grew year on year and the trail was adopted as part of the Havant Arts Trail from 2004-2011. 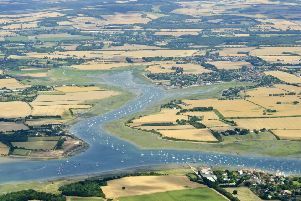 In 2012 Emsworth decided to revert to an independent trail enabling it to engage directly with local businesses and community. It also enabled the number of artists taking part to flourish. This year, more than 100 artists will display their work throughout the village during the course of two weekends on April 28, 29 and May 5, 6 and 7.